Adam Posen (Peterson Institute) outlined eight priorities for the European Union during a presentation at the wiiw Spring Seminar. Watch his full speech here. 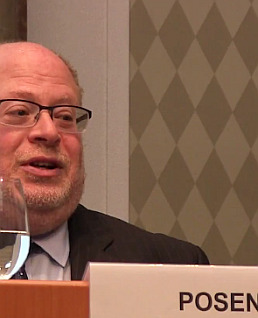 Adam Posen, President of the Peterson Institute for International Economics in Washington D.C., presented his views on the current state of the EU, pressing and upcoming economic and political challenges, and a list of eight priorities for EU policymakers in his keynote speech at this year’s wiiw Spring Seminar. Given the current path of US President Trump’s administration, get together with China to collaborate on trade and environmental issues. Accept the reality that the US security guarantee has become less real. Invest in defence and try to build a pan-European defence institution. This will also help to build an EU identity. Implement measures to increase the EU’s soft power, for example by attracting foreign students. Although controversial, consider seriously the formalisation of a two-tier labour market in light of ongoing immigration patterns to support the integration of migrants. Push for service market liberalisation, including high-skilled professions. Reduce cross-border barriers for banking integration. Increase public investment linked to structural reform. Re-think the idea of the EU’s convergence funds.